Basel is a mix of medieval and modern. The city’s museums have some of the oldest, largest and oddest collections in Europe and the world, from the grandest teddy bear collection to the non-traditional art of Jean Tinguely. 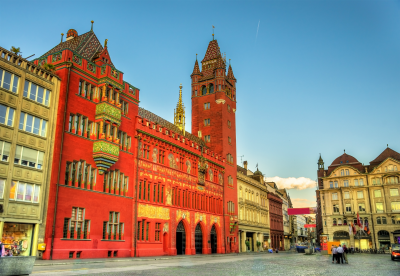 A visit to the medieval city center should start with the striking red sandstone city hall in Marktplatz. From here, head to the magnificent Rhine River which curves its way through town – on a warm day, you’ll see the locals floating by. Why not join them? 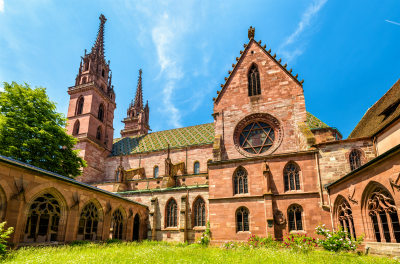 Located in the northwest corner of Switzerland, near the borders of France and Germany, getting around Basel is easy (and fun). There is a spider web of trams and buses that crisscross the city and get visitors to where they want to go effortlessly, with minimal walking. Plus, it’s all above ground so there’s never any guessing as to where you are. 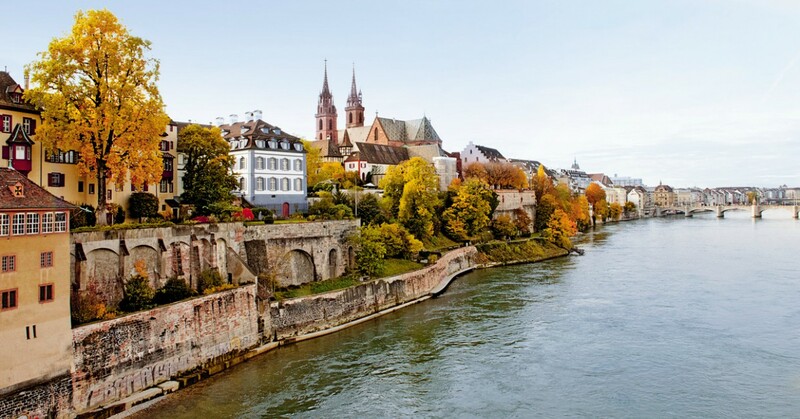 Here’s our list of the top fun attractions and great things to do in Basel. What an amazing find: four floors, packed from floor to ceiling with dolls, teddy bears, miniatures and antique toys. You can spend hours here! The museum visit starts on the fourth floor with its beautifully displayed antique teddy bears. All told there are over 2500 teddies here, the largest such collection in the world. Each floor is packed with rare and beautiful displays, with countless incredibly detailed miniatures and dollhouses sure to spark the imagination. Guided tours take place on the first Saturday of each month at 2pm and last approximately an hour. Additional guided tours through the museum, including special exhibitions, can be booked in German, French, English and Russian via Basel Tourism. 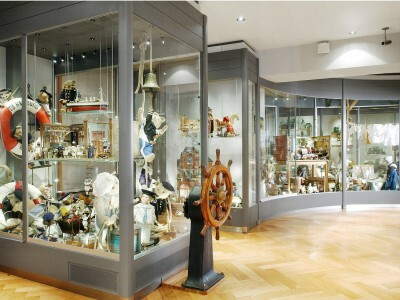 As you leave, be sure to take a look at the extensive collection of unique items available in the museum’s boutique. Ristorante La Sosta restaurant is an elegant way to finish your tour of the museum, and can also be accessed without admission. Tips & Tactics: A great time to visit is Christmas when the museum adds exhibits featuring edible decorations that were common on the 1600s, including nuts, apples and pastries. 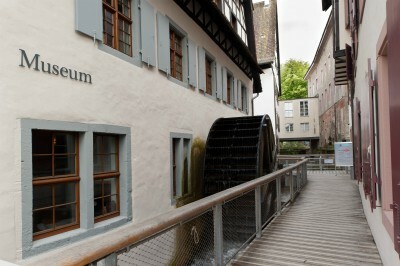 The Basel Paper Mill Museum – aka, the Swiss Museum for Paper, Writing and Printing in Basel – is located in a medieval paper mill that’s powered by a large waterwheel. Basel in fact became important thanks to its role in the development of the science behind making paper, an industry which attracted countless famous writers from far and wide. These days, visitors can explore four fascinating floors of exhibits and several interactive stations starting with paper making and finishing with binding a completed book. The museum is a lot of fun, and all ages are encouraged to participate in activities and hands-on exhibits including making paper, trying your hand at calligraphy, typesetting, typing and more. There is also a restaurant and museum gift shop that has many paper products to choose from that are made on site, along with a wide selection of local crafts. Free-guided tours are available in German on Sunday’s at 11:30am, while groups from four to 20 can have a tour arranged in advance for a fee in one of four languages – German, French, English, and Italian. 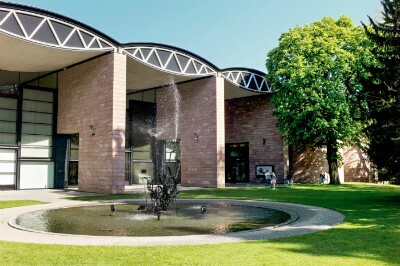 Visit their website at https://www.tinguely.ch/en.html to arrange a tour. The beautiful Tinguely Fountain is one of the most visited and well-known spots in Basel. Located near the Basel Theater, just up the block from the tourist office near Barfüsserplatz, Jean Tinguely’s magnificent creation was built in 1977 and is notable for its many moving pieces that squirt and splash water. 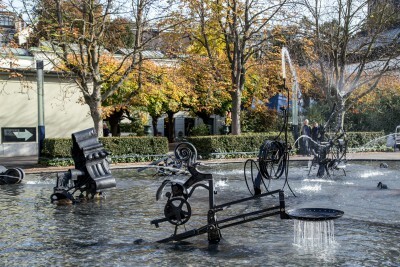 All told, Tinguely crafted nine iron sculptural machines to ‘play’ in the water and ‘talk’ to each other. The fountain runs year-round, and during the winter the ice sculptures it forms are particularly entertaining to look at. Tops & Tactics: If you’re planning on meeting anyone in Basel, just tell them to meet up at the Tinguely Fountain – right away everyone knows where to go! Barfüsserplatz is also very popular for its many museums, restaurants and places to get coffee. It also has a flea market on Wednesdays, starting at 7am, which is notable for its antiques. Visit the Papa Joe’s website at http://www.papajoes.ch/en/Home/index.php. Basel Münster (or ‘Basel Minster’ in English) is a magnificent gothic church with a striking design that can be seen from miles away. From its detailed spire towers to its cloisters and crypt, there is much to see here. While perhaps not as well known as other European churches, it boasts a rich history along with beautiful architecture. Add to this the superb views from its spires and it’s easy to see why it’s the third most visited attraction in Basel. If you are fit and mentally prepared for a climb, be sure to take the time to ascend the spire. The views are amazing, so be sure to take your camera. Tips & Tactics: In August, a large screen is erected in Münsterplatz (the plaza in front of the church) for the screening of movies. This has been an annual event for over 25 years and makes for a fun outing on a warm summer’s eve. For information, visit the münster’s website at https://www.baslermuenster.ch/. In case you don’t make the hike up to the top of Basel Münster’s spires, be sure to wander back behind the church. There you will find a park that has many shade trees, seating to rest those weary feet, plus magnificent views of Basel, the Rhine and across to Germany, too. It is open year around, with no entrance fee, and is considered by many as the most romantic spot in the city. From here, it’s easy to access the church or head down the stairs to the river. 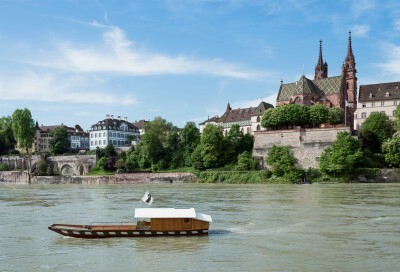 One of the unique modes of transportation still used today in Basel are the old ferries that can quickly take you across the river to the other side for a small fee. Non-motorized, these remarkable vessels rely on the river’s current and tether lines to haul them across. Established in 1290, Marktplatz remains the political center of Basel, and is home to Basel’s majestic Town Hall. Built from distinctive red sandstone, which gives it a striking appearance, the structure is famous for its striking tower and detailed artistic decorations, making it one of the city’s most important landmarks. Thirty-minute English language tours are offered by Basel Tourism from April to October, and spaces can be reserved (check their website for current times and availability: https://www.basel.com/en/Media/Offers/Guided-tour-of-the-City-Hall). In addition to the Town Hall, the Marktplatz is also worth visiting for its many events and a weekday market with fresh vegetables and specialties, along with its many restaurants and shops. From here, it’s just a short walk to the Rhine and one of the oldest bridges crossing the rover, Mittlere Brücke. Originally built in 1226, the bridge was rebuilt in 1906, and today makes for a wonderful photo opportunity. 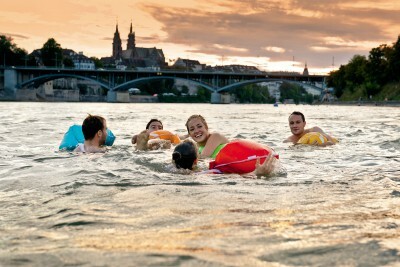 In mid-August, the Rhine River Swim draws thousands of people to wade into the river at the same time to float downstream in the swift current. One of the city’s most popular events, it has grown to include a carnival-like atmosphere with free floats, balloons, sunscreen and more being given to participants. The river is in fact a popular destination all summer long, when visitors will see countless heads bobbing along the river all day long. Most participants will carry a colorful reusable bag that can hold their clothes, shoes, and a towel while they’re enjoying the refreshing water. The bags – sold at many stores, including at the information office at Barfüsserplatz – allow you to get in the river upstream, float down river, and then be on your way. Best of all, you don’t even have to return to where you started to collect your dry clothes – very helpful.